I’ve mentioned before how toddlers are better off on a balance bike than on a trike. But what about little ones that are too tiny for a balance bike but are curious about biking? When my son was about 11 months old, we were vacationing in Sun Valley, ID when he saw the Schylling Scuttlebug outside a toy shop and fell in love. At this point he was barely taking steps, and not fully walking yet, but he could scoot scoot scoot on the Scuttlebug. 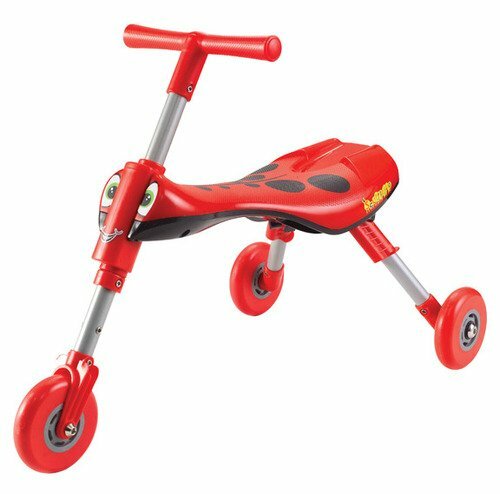 The Scuttlebug’s portability, the cute design, and the quality construction make this one of my favorite “pre-bikes.” If you little one is old enough for a balance bike (usually around 18 months), get them one. If they are still just learning to walk, however, consider the Scuttlebug. It provides the perfect introduction to a lifetime of cycling. If you have a biking family, chances are your little one is interested in biking too. They’ve seen mom and dad on their bikes, or big brother and sister. Because kids at this age are great imitators, it is the ideal time to get them interested in cycling. The Scuttlebug is appropriate to introduce as soon as your little one begins to show an interest in walking. They will be thrilled by the mobility it provides! 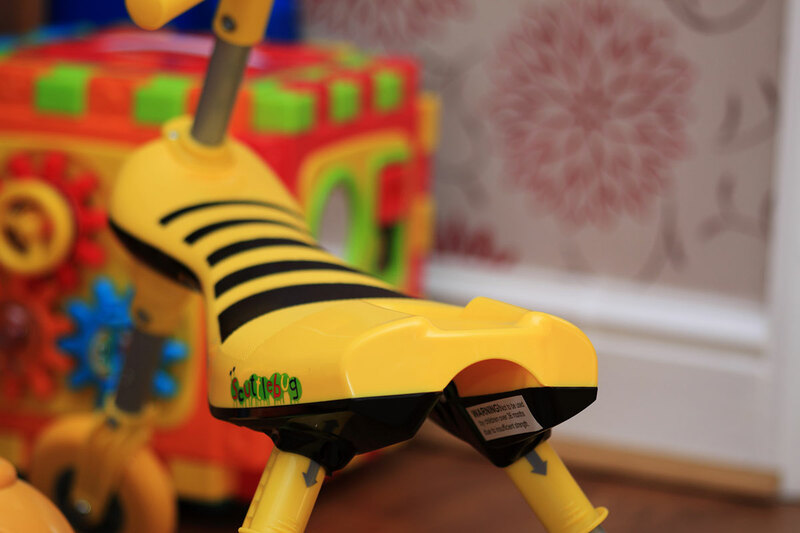 Because they “scoot” on the Scuttlebug, they will also begin to get the feel for powering themselves forward, and this is a skill that will transfer to the balance bike once they are ready for it. The handlebars are also easily maneuverable, so they begin to build steering skills. Compared to other trikes, the Scuttlebug is extremely lightweight. Because it is designed for very young toddlers, it’s tiny. At only 4.2 pounds, it is easy for little ones to scoot around the house with ease. I should mention here, the wheels are a rubber-type material that don’t scratch floors. We have hardwood floors in our house and I’ve never noticed any damage from the Scuttlebug. The one drawback is the small wheels. While they work well inside the house or on smooth pavement, as soon as there are cracks in the sidewalk or other obstacles, it becomes difficult to maneuver. The thing that sold me on the Scuttlebug is just how darn cute it is. We have the ladybug design, and it is even cuter in person than in the pictures. Grandmas everywhere will swoon. One thing to keep in mind when buying the Scuttlebug is that, like all things at this age, kids will quickly outgrow it. 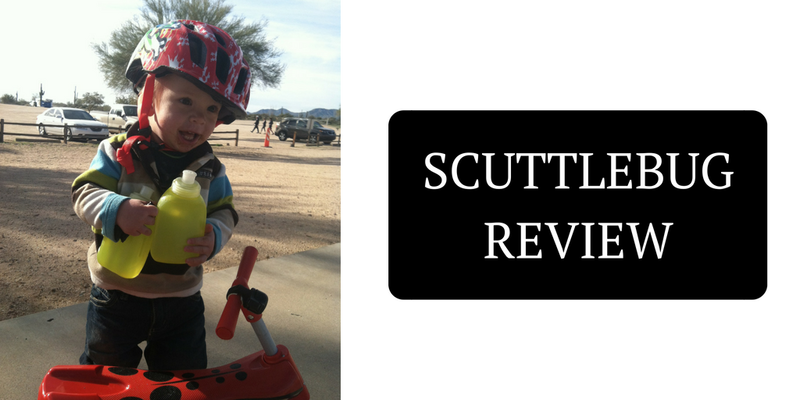 Our son used his Scuttlebug on a near-daily basis from 11 months old to 18 months old. At that point, he transitioned primarily to a balance bike, although he would still ride it (mostly inside the house) until he was 2.5 or 3. By that time, it was really too small and not fast enough to be exciting anymore. Despite the limited amount of time that your child will ride this bike, I still believe it is a worthwhile buy, especially for the $39 price tag. For the price, the build is excellent. We’ve left the Scuttlebug out in the rain and the snow. It’s been ridden by a too-big boy off bicycle ramps in the driveway, and despite all this, it is still in excellent condition. The casters in the wheels roll smoothly, and the plastic seat has neither cracked nor faded. For the child who is too little for a balance bike, the Scuttlebug provides a great introduction to a lifetime of cycling. Get them addicted young, and you’ll never have to prod a crying 5-year-old to ride their bike. For the price, the Scuttlebug makes a great first birthday present or “just because” gift from grandma and grandpa.